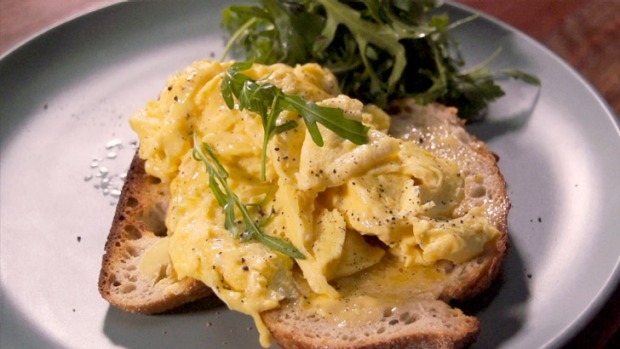 Do your scrambled eggs turn out differently every single time - from soupy to rubbery? Here's how to get soft, creamy curds, every time. If your scrambled eggs turn out differently every single time - from soupy to rubbery - then step up to the plate now. These are the best scrambled eggs EVER, utilising Bill Granger's original technique at Sydney's bills cafe to create big, soft, golden, creamy curds. The trick? Using a simple wooden paddle that pushes the eggs around the pan as they cook, allowing them to build up into a fluffy mousse. Break the eggs into a bowl, add the milk or cream, salt and pepper, and gently whisk. Melt the butter in a frying pan over medium heat, swirling it to coat the bottom. Immediately pour in the eggs, and step away. Count to 20, resisting the urge to move the eggs. Now, use a wooden paddle to sweep the eggs around the pan. As the cooked egg builds into fluffy curds pushed by the paddle, the uncooked egg pools over the hot surface of the pan ready to be swept up as well; so that neither overcook. Do one last sweep of the paddle to bring it together, then remove from the heat, as the eggs will continue to cook in the heat of the pan. Divide the eggs between two thick slices of hot, buttered sourdough toast, scatter with herbs and serve with a rocket salad. . TIP: Put the toast on first, as the eggs will seriously take less than a minute to cook.